CARBONDALE, Ill. — Several Southern Illinois University Carbondale students are participating in a unique program designed to help them become more innovative, creative and entrepreneurial and to foster those traits in fellow students. This is the largest group of Salukis ever selected for University Innovation Fellows, a national leadership program. Jacob Coddington, an MBA student from Glen Carbon. Emma Johns, a senior physiology/pre-medicine major with minors in chemistry and American Sign Language, from Villa Grove. Nathaniel Jordan, a junior plant biology major with a specialization in molecular and biochemical physiology, from Rockford. Carly Kasicki, a biology/French/German major with minors in chemistry and political science, from Rockford. Savannah “Claire” Moore, a junior communication studies/public relations and political science/pre-law major, from Springfield. Adam Vogel, a junior mechanical engineering major with mathematics minor, from Bloomington. In addition, Mary McGee, a senior psychology major from Naperville, was a 2016 fellow and she is now working with the new Saluki Innovation Fellows. She is assisting SIU’s FirstGen Committee and Karla Berry, director of the Center for Teaching Excellence, in creating an online “survivor guide” for first-generation college students. The new fellows have all competed six weeks of online training in the program, which is operated by Stanford University’s Hasso Plattner Institute of Design (d.school). They’ll also attend the University Innovation Fellows Silicon Valley Meetup, an intense training experience next spring, and will participate in business and innovation immersion experiences at Stanford, Microsoft Google. They’ll join in a variety of events and conferences especially created for fellows, learning about innovation spaces, movement building and creating experience designs and innovative models for change in higher education. They are also collaborating with faculty, developing new curriculum and hosting experiential learning events. In all, 358 students from 96 institutions of higher learning in 16 countries were selected as participants in the “agents of change” program this year. SIU had its first University Innovation Fellow in 2013 and Katie Dzugan converted her experience into a position as the first network development director for the fellows program at Stanford. Since that time, a total of 16 students and two staff Salukis have completed the program with many going on to become successful entrepreneurs in the world of business. Lynn Andersen Lindberg, associate director of the SIU Research Park, is excited to have such a large group of fellows this year and anxious to see where this training and experience will take them. Also serving with Lindberg as mentors for the SIU students are Berry, Kyle Harfst, SIU Research Park director, and James Garvey, interim vice chancellor of research. Each innovation fellow selects a special project of his or her choosing to work on. Alex Hutchinson, a 2015 participant, is the owner of Recipe Revolution, a recipe conversation app, as well as a business banking analyst. Other SIU fellows have gone on to careers in filmmaking, consulting, marketing and other venues. As their project for the year, Coddington Kasicki, Moore and Jordan have been working with the University Honors program to create an innovation class that will be taught next fall. The other participants are finalizing plans for a variety of projects, putting what they’ve learned into use. 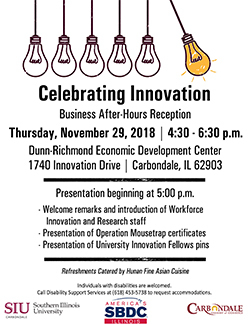 The University Innovation Fellows will be “pinned” during a special ceremony at the Celebrating Innovation Business After-Hours Reception slated for 4:30-6:30 p.m. on Thursday at Dunn-Richmond Economic Development Center, 1740 Innovation Drive in Carbondale. Hosted by SIU, the Illinois Small Business Development Center and the Carbondale Chamber of Commerce, the event will also include other SIU- affiliated entrepreneurship and innovation recognitions. For more information about SIU’s University Innovation Fellows or other innovation and entrepreneurship activities and initiatives email lindberg@siu.edu, call 618/453-6754 or visit https://researchpark.siu.edu/university-innovation-fellows.